Autumn raspberries provide fresh fruit from August to October. Raspberries can be planted as bare-root plants in the autumn. For late summer and autumn fruiting varieties you can leave it until late autumn to plant but a bit of soil warmth will help them get established. Primocane varieties are cut down to the ground each year and grow a new cane which fruits later that summer or autumn. Floricane varieties that we grow for summer raspberries fruit on the canes produced the previous year and we think of them as summer varieties. Tending Tips for Autumn Raspberries. Autumn varieties fruit on this year’s new growth (primocanes). In March or April give a good general purpose feed of Growmore or chicken pellets. Fruit is borne on the top of the canes. Take care if you thin out spindly stems in early summer. Raspberries are a hungry and thirsty fruit. Prepare planting area removing weeds and adding compost a few weeks before planting. Spread the roots out and firm the soil. Autumn Bliss is the doyen of late fruiting raspberries. They can be picked from August until the first frosts. I has a good plateful in November last year. Autumn Bliss raspberry canes are short, sturdy and spiny. It need little support, so it is generally not necessary to grow it on horizontal wires unless your soft fruit garden is in a particularly windy spot. Joan J is an improved version of the Autumn Bliss raspberry. The fruit are said to be firm and well flavoured but I haven’t grown them as yet. Autumn Gold is a yellow raspberry allegedly with all the flavour but not the colouring. I think the space is better devoted to the real thing. Autumn Treasure is a new primocane fruiting slightly later than Autumn Bliss and continuing until the Autumn frosts. The berries have good flavour, are bright in colour, and have a long conical shape. It has spineless upright canes. Isabel is fine flavoured and a little juicier than Maravilla and other primocane varieties include Pacifica deep red berry with aromatic flavour, Ambrosia one of the best tasting of all Dulcita and Encore. The raspberry season can be extended by careful selection of appropriate varieties. 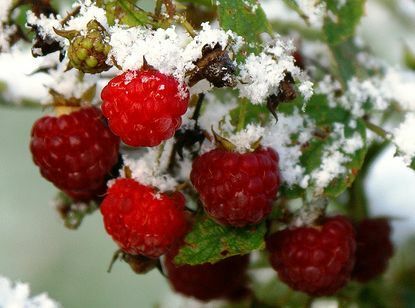 I can’t promise snow resistant varieties but the following list gives some idea of what raspberries to select for sequential seasonal picking. Malling Minerva may win the competition for the earliest raspberries fruiting from the beginning of June. Picking will last about six weeks. Glen Moy an AGM winner is better known and widely grown as a June raspberry. The large fruit have a reputation for a firm texture and good flavour. Plant these varieties before the last frosts – they can currently be bought at most garden centres in bundles of canes ready for planting individually. If the ground is too hard keep well wrapped and plant when it thaws. There is a wider choice of Raspberries suitable for July and August cropping and this is just my choice. Glen Ample AGM has conical shaped berries that are favoured by pick your own growers. Glen Prosen is a variety that I grow because they were available when I wanted to plant them. At least they make great jam. The ‘Single fence with parallel wires’ system is well suited to autumn-fruiting raspberries.Tying in of primocanes is not necessary. Picking is more difficult, and there is a greater chance of fungal problems in the more crowded conditions. Drive 8ft long and 3in diameter posts into the ground to a depth of 30in at 15ft intervals. Attach two short horizontal lengths of timber to each post, one at the top, and one 2ft below. Stretch 12 gauge (3.5mm) galvanized wire in parallel lines along the ends of the horizontal lengths of timber to create two parallel lengths of wire along the fence. Stretch thin wire or garden twine between the parallel galvanized wires as cross ties, every 2ft along. The raspberry canes do not need tying in, as they will be supported by the parallel wires and cross ties.